Ewan McGregor to Return as Obi-Wan Kenobi in Star Wars 9? According to a new report, Ewan McGregor is going to reprise his role as Obi-Wan Kenobi in Star Wars 9. Last week was a big one in terms of news surrounding the Obi-Wan movie that Lucasfilm has in development. It was first announced that the studio had put all of the upcoming Star Wars anthology films aside for the time being, which included the Obi-Wan film. Lucasfilm later debunked the rumor, but there are still reports that director Stephen Daldry has exited the project, which means that it's back to the drawing board. Star Wars fans were excited about the idea of a possible return of Ewan McGregor to the franchise, even though he had never been confirmed for the role. The Sun U.K. is now reporting that McGregor will secretly film scenes for the upcoming J.J. Abrams-directed Star Wars 9. If proven true, this would be massive news for fans, especially since there have also been rumors of the return of Billy Dee Williams as Lando joining the cast. However, it should be noted that this report comes from the Sun, who isn't the most reputable place for factual reporting most of the time. Ewan McGregor was spotted at the Solo: A Star Wars Story premiere, which also added to further speculation that he will be signing back on to play Obi-Wan, but it's entirely possible that he was just going to enjoy the movie for fun. 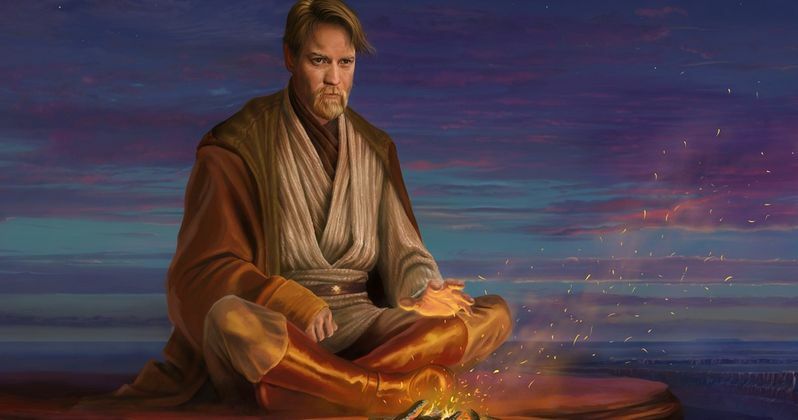 Everybody's favorite YouTuber Mike Zeroh reported earlier this month that McGregor was in talks with Lucasfilm for the standalone Obi-Wan Kenobi movie, which also noted the April 2019 production start date that has been floating around. But, if Stephen Daldry actually left the project before the release of Solo, it would seem that this report is false. As far as seeing Ewan McGregor back on the big screen as the iconic Jedi master, Star Wars 9 seems like it is the safest bet at this time. Even then, it will more than likely be a small cameo like Frank Oz returning to voice and do the puppeteer work for Yoda in The Last Jedi. Mark Hamill will more than likely be back as a Force Ghost, so the idea of Obi-Wan showing up isn't too far-fetched, especially since Rey will be getting stronger with her use of the Force. Star Wars 9 is currently in pre-production and is expected to begin filming next month. As with all Lucasfilm projects, the specifics are being kept secret, but with filming set to begin soon, we can at least expect to see some behind-the-scenes set photos in the near future. Additionally, if Ewan McGregor is spotted anywhere near Pinewood Studios, the cat will definitely be let out of the bag about the return of Obi-Wan Kenobi. You can read the original report about McGregor signing on for Star Wars 9 at The Sun U.K.